WARNING: IF YOU'RE PRONE TO SEIZURES AND EPILEPSY, DO NOT PLAY THIS GAME. YOU HAVE BEEN WARNED. 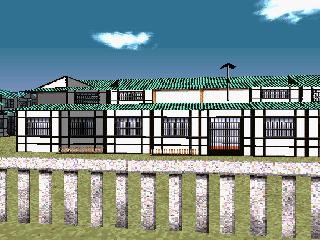 LSD Dream Emulator is a japan-exclusive game made by Asmic Ace, based on a dream journal from someone called Hiroko Nishikawa that has been updated for 10 years. Before anything else, I want to tip my cap off to her for enduring 10 YEARS of true nightmare. The game is basically a first-person open ended exploration through the dream world. And this is not just a happyland type dream world, it's a trippy as f**k dream world. You probably seen a few screenshots before, seeing that you won't end up here by accident. 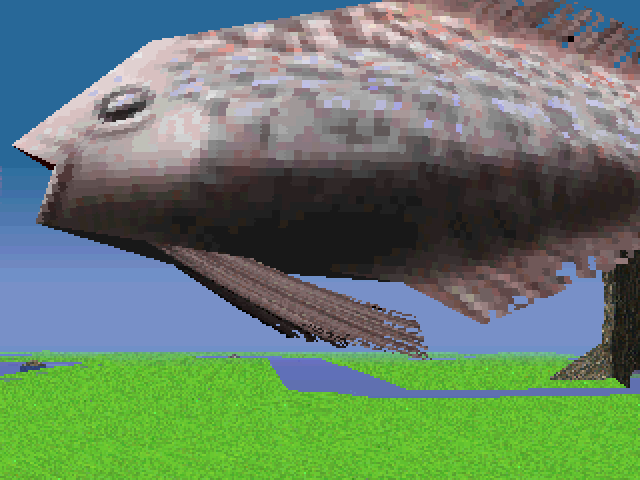 Anyways, the dream worlds can offer a lot of trippy, confusing stuff happening around it. However, these stuff are randomized and pretty rare, so most of the time you're just walking around the damn place and sometimes I feel the dream world is too broad and too barren. It's exciting and creepy once you find the strange stuffs, but in between the strange stuff are boring segments of walking. It's kinda like EarthBound, minus the RPG elements. 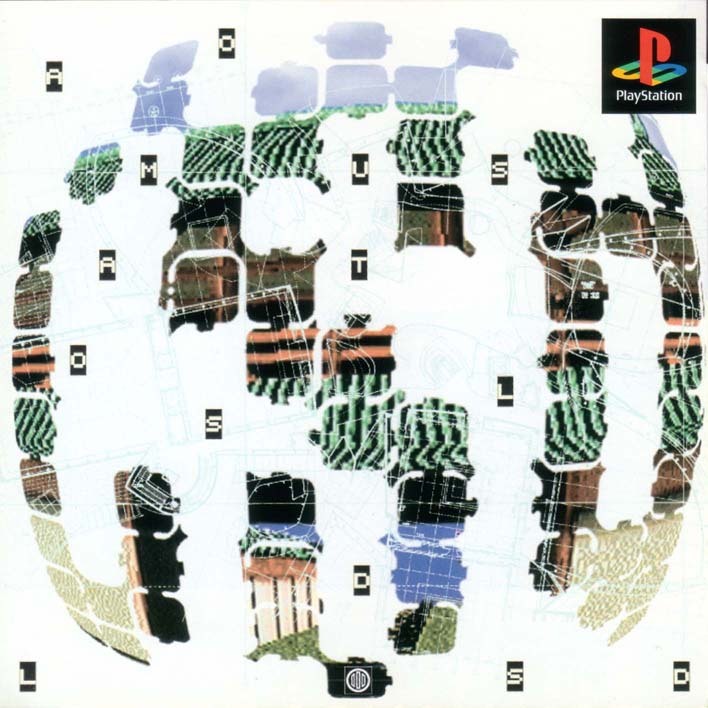 The soundtrack is freaking awesome, one of the best soundtracks in the PSX library. Too bad the BGM always gets drowned by the loud and annoying footstep noise. The visuals are nice too, though the draw distance is awful, but I'm fine with that, since it is the hardware limitation that made it. 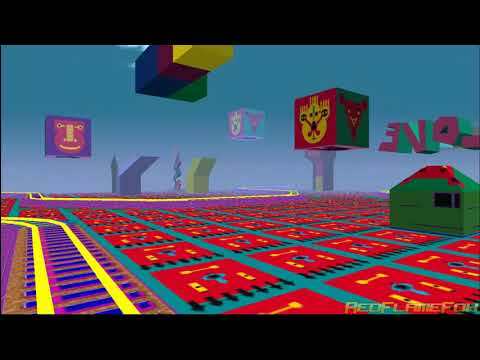 Overall, LSD Dream Emulator is a good exploration game, but only if you're patient enough to find the trippy things this game has. If you want to trip out without actually tripping out, then this game's for you. 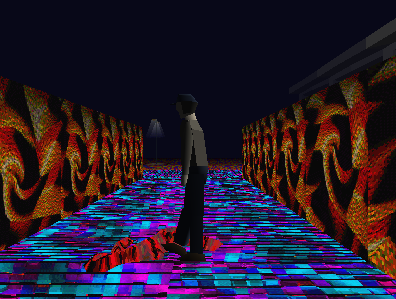 A trippy game where you explore increasingly messed up lands during a 'dream', you enter the next land by bumping into anything in your current land. 70% of the time you will find nothing but scenery, and in the remaining 30% you will find... other things. 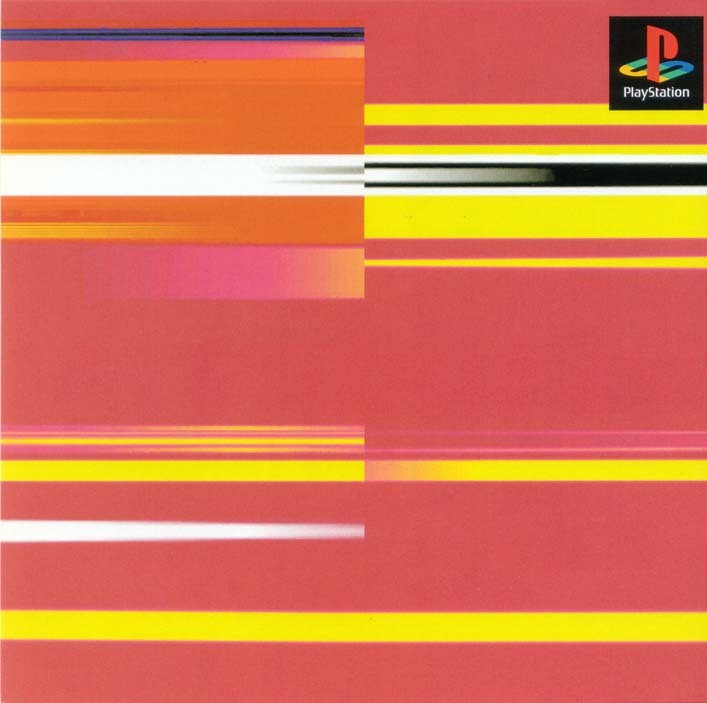 Notable for the music, also called 'patterns' and the fact that the game intentionally deteriorates its engine for making things normal. If you download, you'll se what I mean! This game's trippin'. I just started playing it and I have one thing to say. I'm SO glad I'm not epileptic. 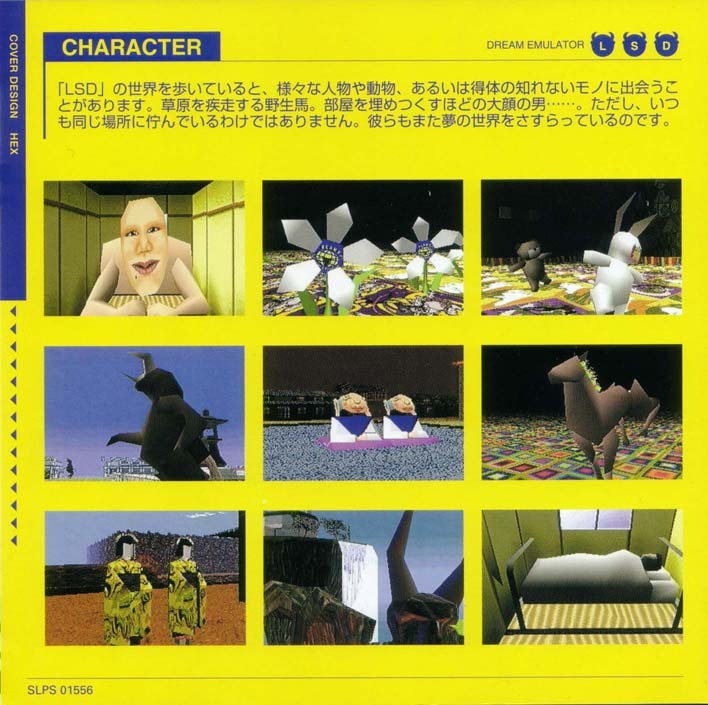 LSD DREAM EMULATOR is a Japan-only obscure game, developed by Asmik Ace, and Designed by Osamu Sato,which is based on a Dream Journal that a man called Hiroko Nishikawa kept for something like 10 years(That was released as a Game product). The game itself has no clear objective, and it's infinitely repayable, they used a day counting system to number how many dreams you already played. Using a First Person perspective, the player progress by teleporting to others places with no defined pattern by touching almost everything that they can see, walls, doors, shelves,trees. That system, is called Linking. The music is also composed by Osamu Sato, and they are played with no certain pattern, you can get over 400 different variations of songs. Two music albums were released(Lucy In the Sky with Dynamites and LSD And Remixes) There are some great songs, like Come on And(that is the game opening theme) and Long Tall Eyelash. It's a good experience playing this game, it's mysterious, you never know what will happen next, and the strange events that occur by progressing in the game(Texture changes, some Videos before starting a day, different and new objects or beings that appear randomly, like a UFO or a rocket, and even a bunch of dead people) will make you want to play more and more. If you like trying different kind of games, I don't see a reason for not giving LSD a try. 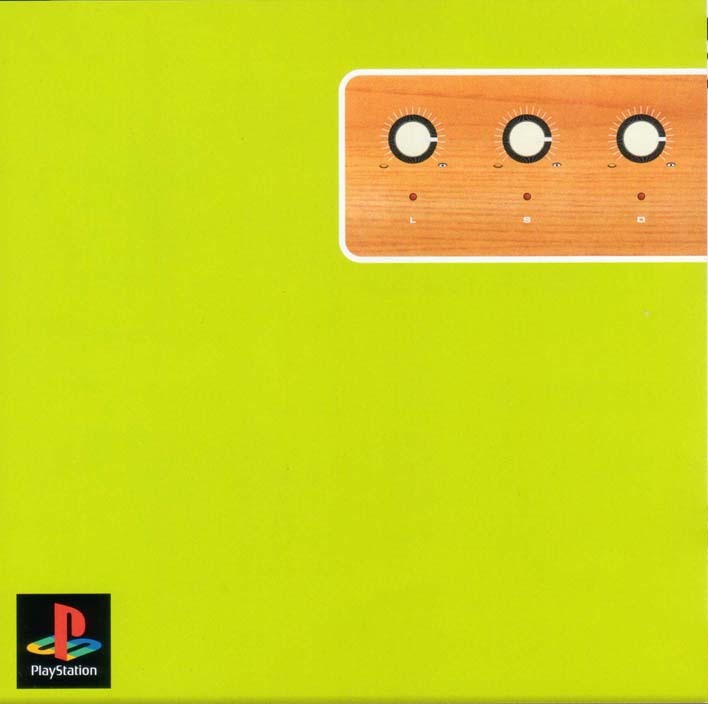 Read all 6 reviews for LSD - Dream Emulator (Japan) Submit your description for this title!